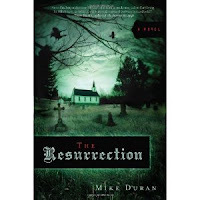 The Resurrection by Mike Duran is a spiritual thriller in the vein of Frank Peretti's This Present Darkness (minus the talking angels). It features a small Californian coastal village that's at the center of a spiritual storm - territorial and generational spirits, demonic influences, and supernatural warfare. The story has it all when it comes to Christian-themed realities. And the book's engaging hook - a modern day resurrection! - offers a gotta-read-it premise. Duran is a solid writer, a very good story teller, and weaves thought-provoking truths and themes into his narrative. A drawback, for me, is that he's a bit top-heavy in characterization and describing settings. Plus his characters get a little talky when they start discussing the theological and philosophical underpinnings of the town's oppression. You're in for a bit of a Sunday school lesson during the first third of the book, in my opinion. At about the half-way mark, however, the story starts to take off and is a thrill-ride once the "evil" (that hasn't made an appearance since that opening scene) finally shows up, which prompts the likable ensemble from Canyon Springs Community Church to move into action. It's not Scooby-Doo, but I did get the feeling that the secret cabal running the town would have simply continued in their deception if it weren't for 'those darn' Christians. Which is okay. I want my Christian suspense novels to end with a win for the home team. But lest you think I dropped a spoiler, Duran's commitment to realism and his narrative touch actually win out in the end, and the denouement is more complicated than a simple victory chant might imply. I liked the ending The Resurrection. Characters emerged with scars but they were better off with the scars. I did too, Jeff. It was a stronger finish than I was expecting. I'm ready to read Duran's next book!